Mine: It's just so much fun to watch . Great cast. Great pacing. Beautiful to look at. 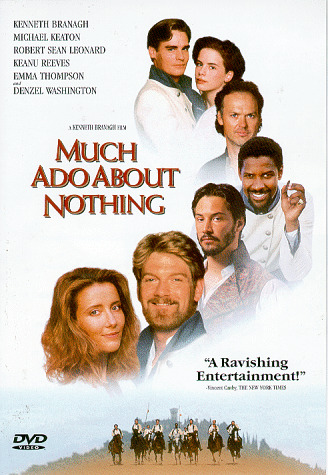 Leonard Maltin/Plot synopsis: Shakespeare's comedy of the wooing of Benedick (played by actor-director-screenwriter Branagh) and Beatrice (his then wife, Thompson) is set and shot entirely in and around an Italian villa in Tuscany and features a top-notch supporting cast. The film is rowdy, high spirited, and remarkably fast paced; this exhilaration brings vigor to the Bard's text, though the poetry sometimes gets lost in the shenanigans. Branagh does impressive job, but cannot match earlier Shakespearean effort, HENRY V (1989).